Here are some of the foods we served for our friends and family. Hot Dogs and Polish Sausages with a sautéed cabbage and red onion slaw. The side dishes included Italian pasta salad, made by a good friend, green salad, chips, dip, and not pictured, slow cooker sweet and sour meatballs. 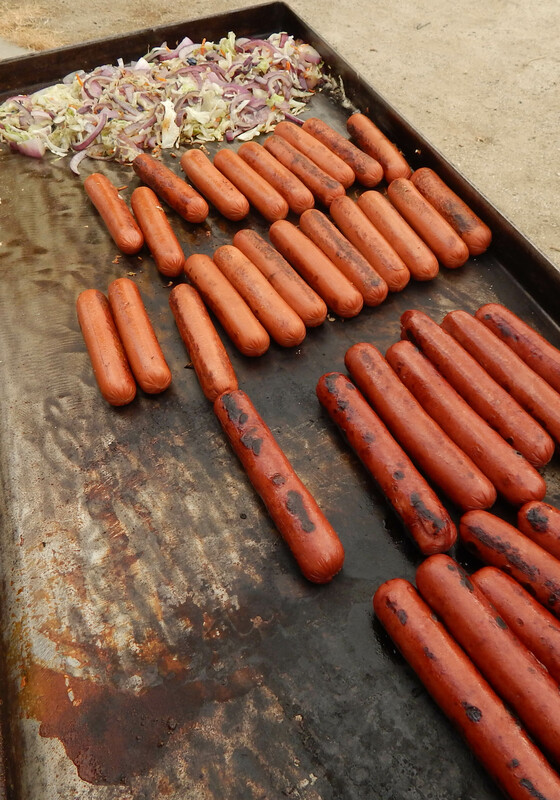 Hot dogs are fun and fast foods to serve. You can make them more fun and extra tasty by adding really good toppings. The slaw I made is simple, but tastes delicious. You cook up some sliced red onion,shredded cabbage and a little margarine or butter (I used I can’t Believe It’s Not Butter) with garlic powder, salt and pepper to taste. Be creative with your toppings. Some ideas include: Chili, cheese, guacamole, diced tomato and onion, chopped bacon, grilled mushrooms, Sriracha sauce. Yum. The list goes on. 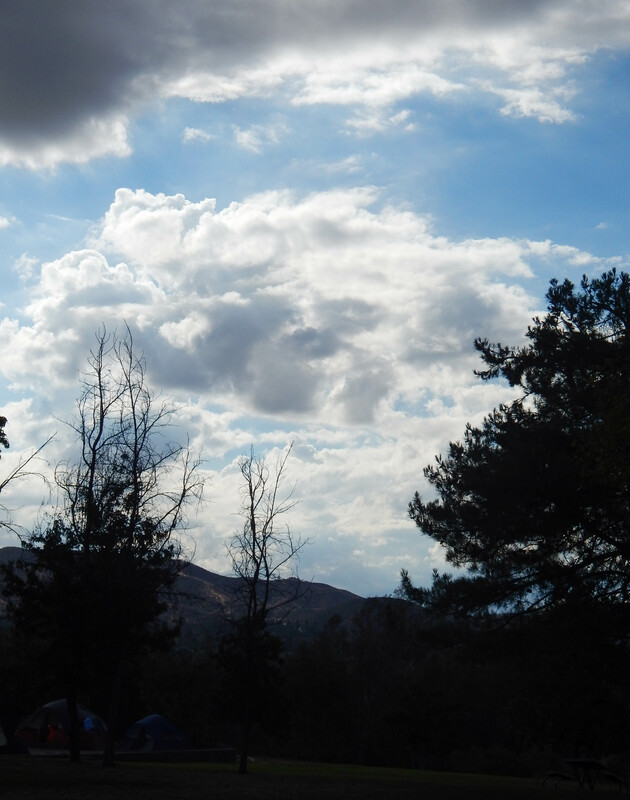 I just love the way the sky looked over our camping area! 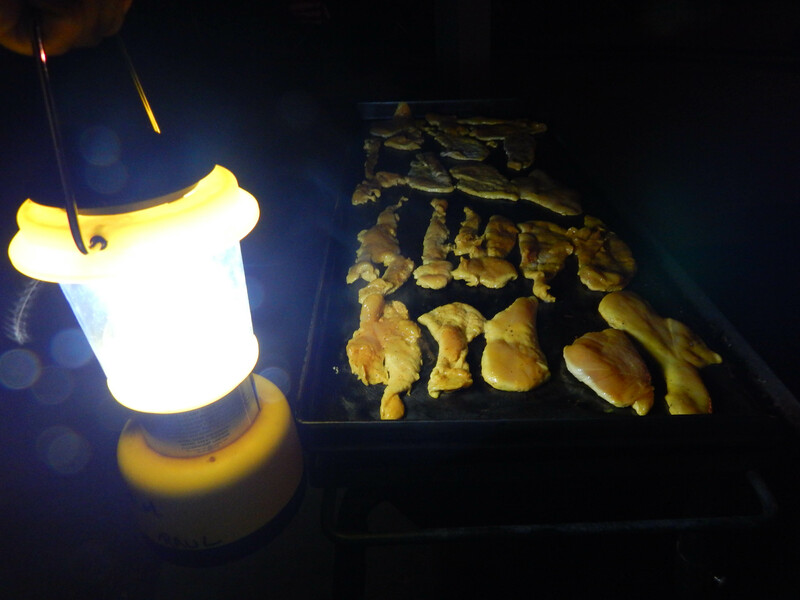 Later that night we grilled up some marinated chicken breast. We didn’t have much light, but we made it work! We served that with beans, rice, tortillas and some killer salsa. We also had sweet corn on the cob. If you can, bring your side dishes already cooked and ready to serve. The less you have to cook and prep at your camp site the more time you have to enjoy yourself. 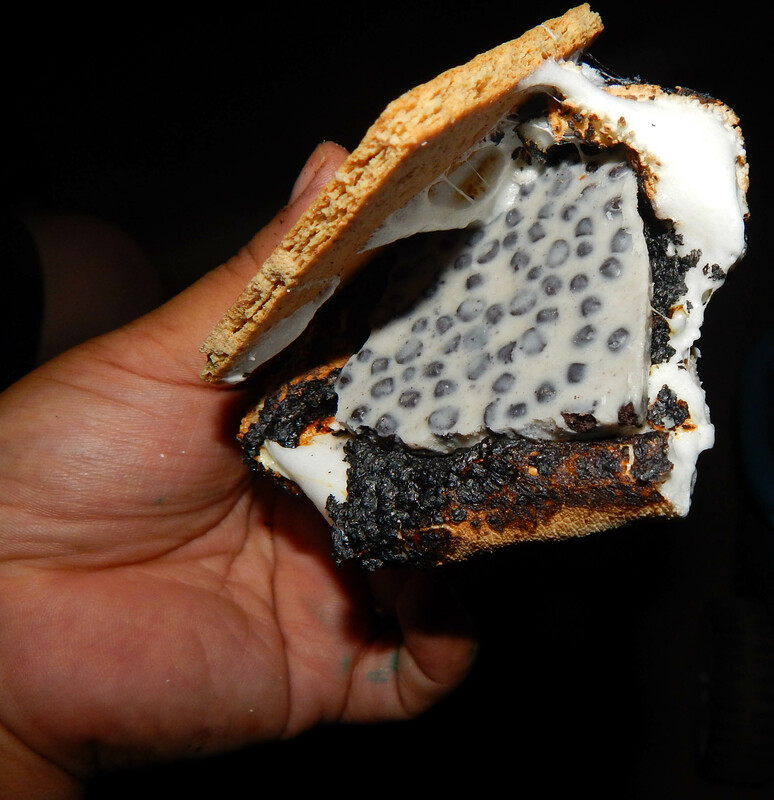 And now… The best of all camping foods…. S’mores! 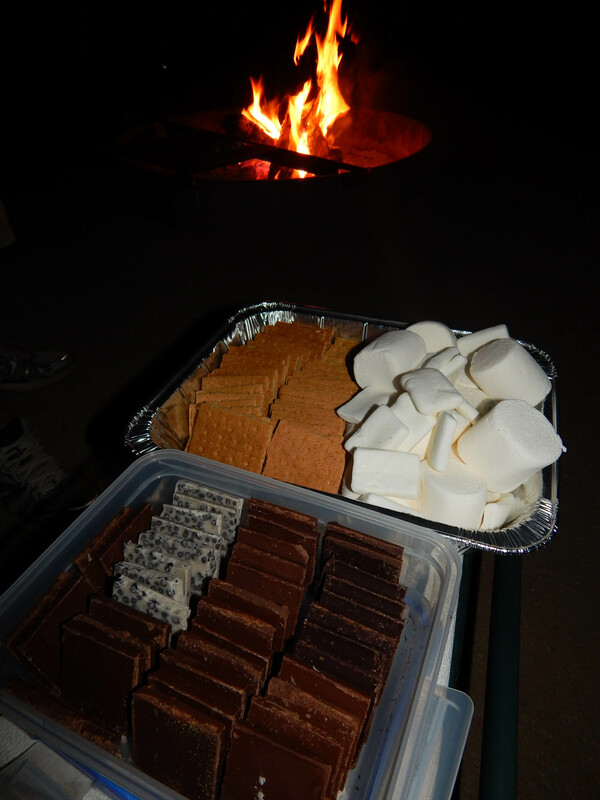 Prepping all of your s’mores ingredients in advance makes the process so much easier. A big “thank you” to a good friend for doing this for us. You can also mix up the classic s’more ingredients. We had giant marshmallows, square marshmallows, milk chocolate, dark chocolate and my favorite, COOKIES AND CREAM chocolate. Wow! Yummm! 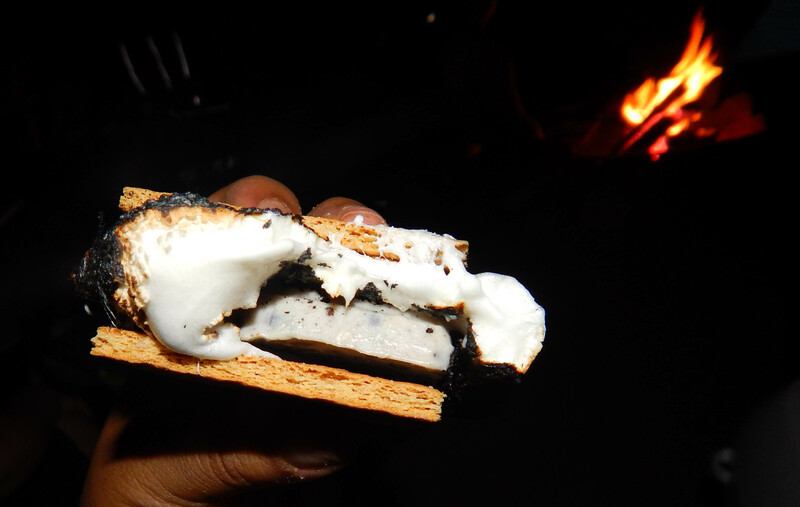 Take a minute to appreciate the melty, toasty, sticky, perfect marshmallow! And then I ate it! Goodnight! The next morning we ate warm delicious Chicken Posole made by my mother in law. It was so good! If you don’t know what posole is, it is a traditional Mexican soup that includes hominy and pork cooked in a savory broth. You usually top the soup with shredded cabbage, chopped onion, sliced radish, lime and hot sauce or salsa if you like it spicy, which I always do! Waking up in nature is a beautiful thing. This was the morning sky. There was also bit of a chill in the air, and that was such a nice break from all the heat we have had in Southern California. It ended up raining that day! We left just in time to avoid it. 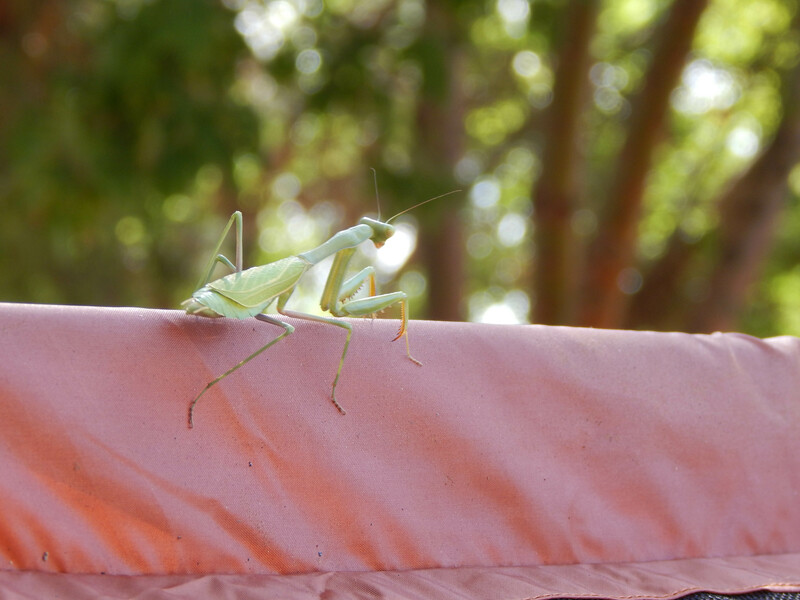 I must have been in a really good mood that morning, because insects usually freak me out, but I thought this little guy was so cute! 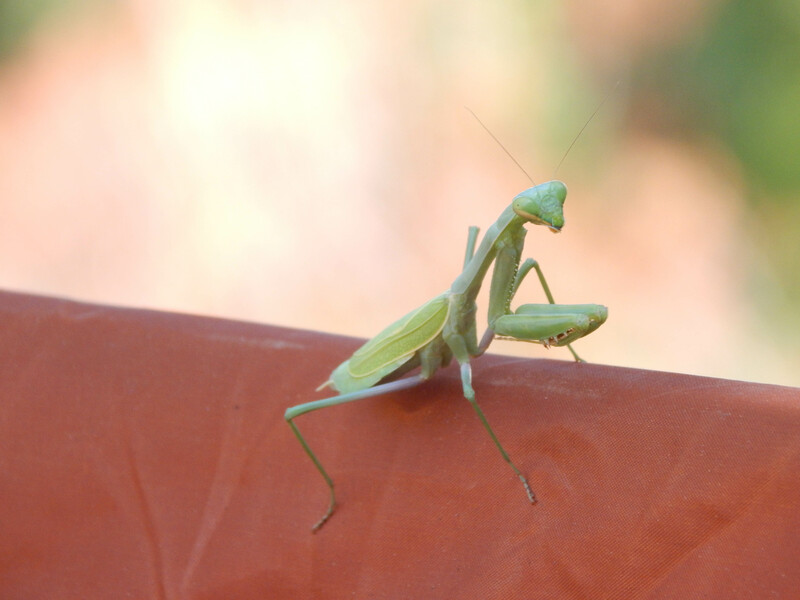 He was just hanging out on top of one of our tents. 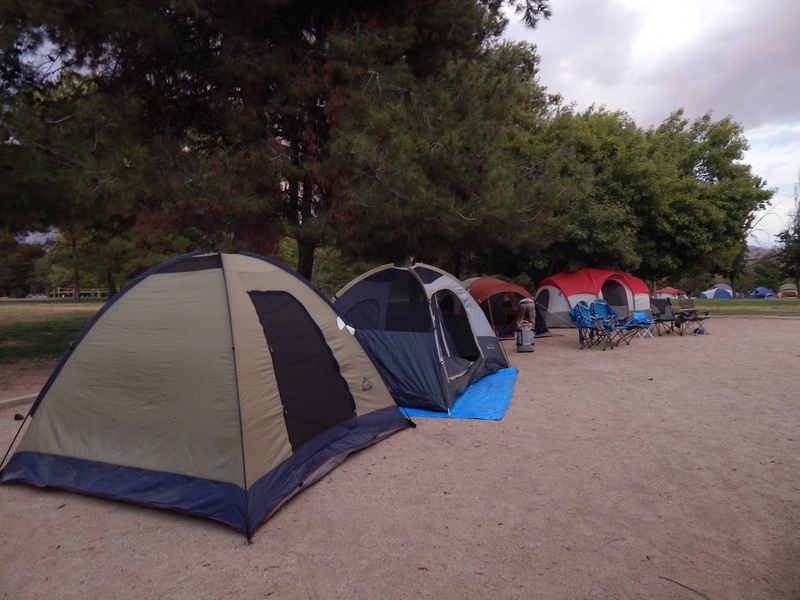 We led him safely onto the closest tree, took down our tents and headed home. Awwww! Thank you, Michelle! Yes, tell your hubby to make you some s’mores for “for the baby” lol Take care and thank you for checking out my blog!